Shanmukhapriya Publications is venturing into publishing books in Carnatic Music for passionate learners. I extend my sincere thanks and regards to all my Gurus who made this possible. Special thanks to all my students and to the music lovers who were sending me mails to start publishing books on various topics. These books which form the part of learning series are priced very nominally, but rich in content. Shanmukhapriya Publications is proud to announce the birth of its First Book in the learning series for the passionate students of Carnatic Music. This book will be very useful for the students of Vocal and Instrumental Music. 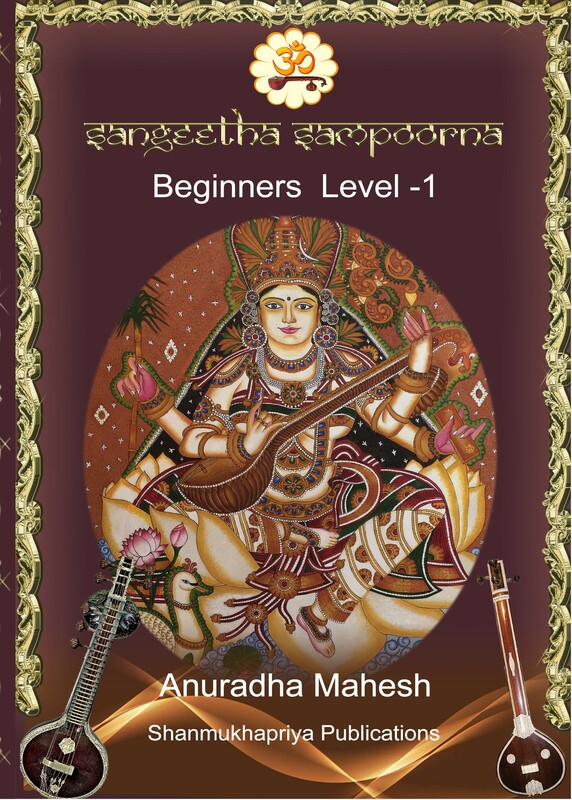 Introducing Sangeetha Sampoorna for the Beginners Level – I. The book is priced at Rs. 400 inclusive of Postage anywhere in India. We are also happy to announce that the book can be despatched to USA, UK , Middle East and other Countries @25 Dollars per copy. Thank you for showing interest in the book. Kindly send an email to learnsangeetham@gmail.com mentioning all the details as specified in the post. It is Rs.300 + Rs. 100 postal charges. We will be sending a reply email quoting the bank account details. Please advise the bank details to remit the amount. Please read fully and send email as mentioned with all relevant details. Wow. Great to see this Madam. The series will b more than a lighthouse for students and aspiring people who want to experience the ocean of Carnatic music. I will also procure the book. Mrs. Anuradha Mahesh, Which books do you recommend for manodharma sangeetham? I have not gone through any books for Manodharma Sangeetham. I think, the Guru is the best person to learn from whom one can learn Manodharma Sangeetham.